Waking up is hard to do. The average human who is forced to rise earlier than their circadian rhythm dictates knows all too well the jolting buzz of the alarm clock on the nightstand, is intimately familiar with the snooze button, and has slept through their fair share of morning meetings. But the modern morning masses should take comfort knowing they are better off than the early risers that came before them: at least we have electronics to rouse us, rather than being forced to imbibe before bed to ensure a wake-up call in the wee hours. Still, we continue the hunt for a better way to wake up, and technology is our go-to resource. Here, a few alternative alarm clocks for the perpetual pillow-clingers. The creators of the new Wakē (“wake-y”) alarm say they want to change the way we interact with technology in the morning. “People shouldn’t wake up in the dark, lose sleep to their partner’s alarm, or be jolted awake by a buzzer,” they say. 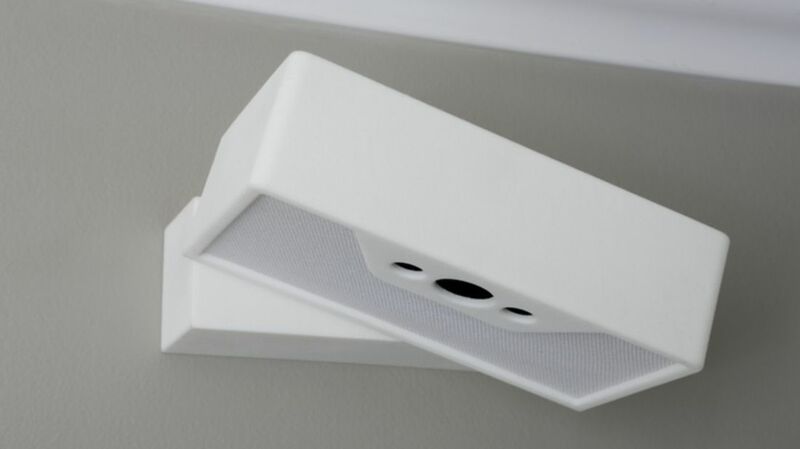 Instead of a loud buzzer, this alarm utilizes soft, soothing sounds that work in conjunction with a white LED light to gently nudge you from your slumber as if you were basking in the glow of a rising sun. Wakē is perfect for couples with different wake-up times because its advanced speakers focus sounds so precisely that only one person can hear them (“like a laser beam of sound”). How does it know who to aim for? Wakē is installed on the wall above the bed and learns your preferred sleeping side. A built-in heat sensor (not a camera!) distinguishes between different bodies. Once the sensor knows you’re up and out of bed, the alarm turns itself off. If you’re one of those heavy sleepers who requires several “back up” alarms in case you don’t hear the first, the Ramos clock might be for you. It comes with three parts: a physical alarm clock, a beacon, and an app. The beacon is placed somewhere in the house, preferably far away from your bedroom. When the alarm rings, the only way to shut it up is to get out of bed, walk to the beacon, and deactivate it with the app on your phone. Even if you try to cheat by unplugging the Ramos, an internal battery kicks in and the alarm keeps on ringing. "This clock is designed to be really annoying and really forceful if you don't do what it says," creator Paul Sammut says. "But if you do what it says, you'll get out of bed, and you'll be up." You could even program the app to make you do exercise in the morning. "Using the accelerometer of the phone, we can do things where you have to do 10 jumping jacks, and a signal will get sent to the alarm to shut off," Sammut told NPR. The app does generously give you the option to snooze, but only for a limited number of times. Once you’re out of snoozes, you’re out of luck (and hopefully out of bed). The Barisieur is a beautiful alarm clock and a coffee machine all in one. It sits on the bedside table and rouses you with the delicious smell of brewing coffee and the gentle clinking sounds of the steel ball bearings that boil the water through heat induction. It even comes with a built-in milk cooler and little compartments for sugar and coffee grounds. If the subtle smell of fresh coffee won’t get the job done, don’t worry: the Barisieur does have an actual alarm you can set. This delicious innovation isn’t yet in production, but you can sign up for progress updates here. Nothing says good morning quite like a bit of arithmetic. When the FreakyAlarm app for iOS gets going, the only way to silence it is by crunching numbers to solve some math problems. Quick! What’s 40 divided by 5 plus 14? The questions may seem easy to the soberly alert, but they require a level of clear-headedness most of us don’t possess when we first open our eyes. This alarm forces users to clear the cobwebs out of their brain, wipe the sleep from their eyes, and focus. The app also comes with maddening logic problems, like ordering a bunch of indistinguishable objects from largest to smallest. And don’t even think about cheating—the app locks the volume button, meaning you can’t turn it down or off until you find the right answer. Some of us get our morning jolt from a cup of coffee. Others need something a bit more drastic. The singNshock alarm, created by Indian-based designer Sankalp Sinha, delivers an electric shock if you press the snooze button. The shock is relatively weak—just strong enough to trigger neurological functions, Sinha claims, and to break you of your snoozing cycle. Makes solving a few math problems seem like a piece of cake, doesn’t it? The Wake ‘n’ Shake app helps you out of bed by getting your blood pumping. The only way to silence the alarm is by vigorously shaking your mobile device. The app uses the phone’s built-in accelerometer to measure the intensity of your movements, and you can set different difficulty levels based on your own needs. If you’re a heavy sleeper, maybe you only need to jiggle the phone for 10 seconds. But if you can snooze through an earthquake, a full minute of violent phone rattling might be called for. Just be careful not to accidentally throw your device across the room.